I purchased this coin this week so I wanted to share and ask a few questions. The coin is the 7th Bell Thaler coin from Brunswick-Wolfenbüttel, a German State. 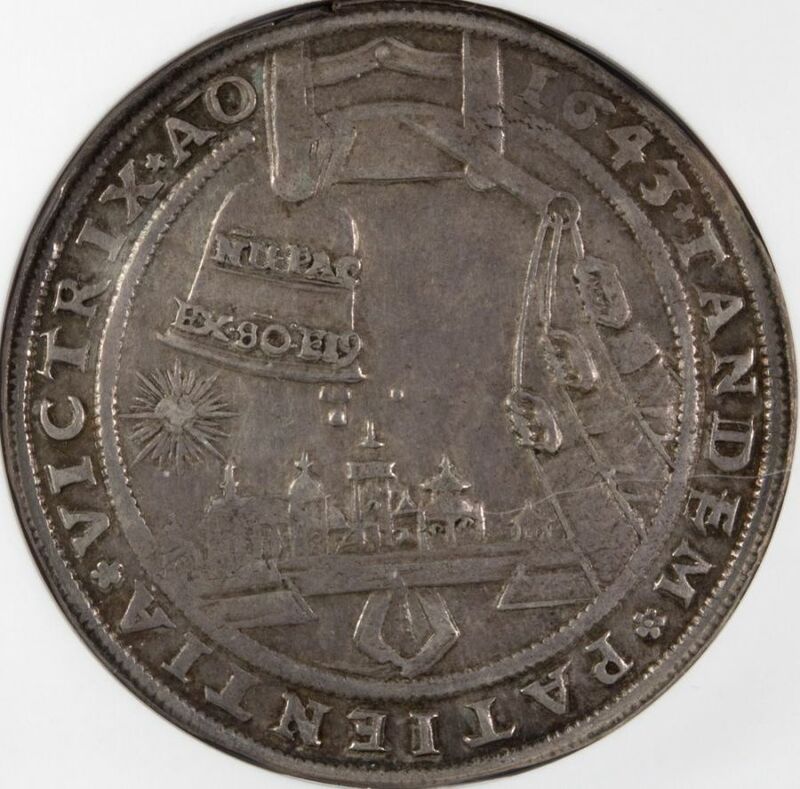 The bell thalers were struck to celebrate the end of occupation near the end of the 30 years way (1618-1648). I have read about Duke Augustus, whose name is inscribed on the reverse. He was the 7th and youngest child in his family and had little chance of inheriting so he committed himself to study. He assembled the largest library of the time north of the Alps and was known as a highly literate person. He did become duke of Brunswick-Luneberg. Wikipedia has some interesting content about him. He would definitely be worth learning more about. Münzen und Medaillen der Welfischen Lande: Das mittlere Haus Braunschweig, Linie zu Calenberg. It is written in German and is available on Google, which will do machine translations of the paragraphs. There is a section that shows the coats of arms but the one on this coin is not shown. 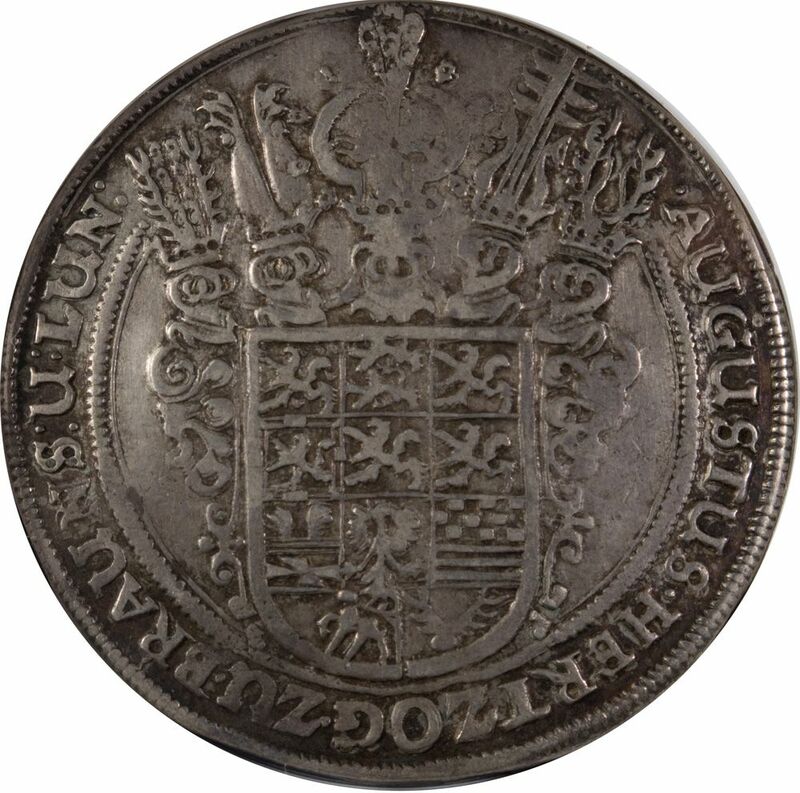 Does anyone know of good resources to research the coats of arms on coins. I have tried many times and can't seem to find the right thing to search for. The other interesting feature on this coin is the seven decorated helmets at the top of the reverse. That is a mystery too that I would like to solve. My Davenport and KM books provide translations for the inscriptions. I can't quite make out what is inscribed on the bell. It looks like "NUPAC EX 80 E19". Yes, another mystery! Anyway, I hope you enjoy checking out this coin. Nice thaler! I have a couple thalers from the Principality of Brunswick-Wolfenbüttel as well as the Duchy of Brunswick-Lüneburg. 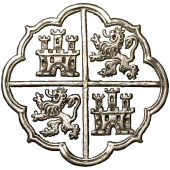 You'll find many references to divisions and reunification of the smaller units of these domains, which accounts for the many divisions of the field in coat of arms. I think the central helmet represents the ancestor Duchy of Saxony -- it displays a galloping stallion that is featured in other coin designs of these areas. Good luck with your research and please share your results here! I don't know why I have not been able to find it before. There is a lot of information about the symbols of the various countries.